WASHINGTON/SEOUL (Reuters) - U.S. President Donald Trump on Thursday called off a historic summit with North Korean leader Kim Jong Un scheduled for next month, citing Pyongyang's "open hostility," and warned that the U.S. military was ready in the event of any reckless acts by North Korea. Trump wrote a letter to Kim to announce his abrupt withdrawal from what would have been the first-ever meeting between a serving U.S. president and a NorthKorean leader in Singapore on June 12. "Sadly, based on the tremendous anger and open hostility displayed in your most recent statement, I feel it would be inappropriate, at this time, to have this long-planned meeting," Trump wrote. It was a dramatic end to weeks of optimistic statements from Trump that by meeting with Kim he might succeed where previous U.S. presidents had failed and persuade North Korea to give up a nuclear weapons program that now threatens the United States. North Korean Vice Foreign Minister Kim Kye Gwan responded to Trump's announcement by saying Pyongyang remained open to resolving issues with Washington "at any time in any way." "We had set in high regards President Trump's efforts, unprecedented by any other president, to create a historic North Korea-U.S. summit," he was quoted as saying by the official Korean Central News Agency. White House officials said that statement in which Pyongyang also condemned U.S. Vice President Mike Pence as a "political dummy" was "the last straw." One senior official said there had been "a trail of broken promises" from North Korea "that has given the United States pause." That included the North Koreans not showing up to a planned meeting in Singapore last week. U.S. Secretary of State Mike Pompeo, who met Kim twice in Pyongyang, said North Korea had not responded to contacts in recent days and Trump had made his decision after meetings on Wednesday in which he concluded the summit would not be successful. "We got a lot of dial tones," Pompeo said, adding it was disappointing but "frankly not a surprise." Speaking at the White House, Trump said he remained open to dialogue but had spoken to Defense Secretary Jim Mattis and warned North Korea against any "reckless act." He said U.S. allies South Korea and Japan also were ready to shoulder much of the financial burden "if an unfortunate situation is forced upon us" by North Korea. Asked if the summit cancellation increased the risk of war, Trump replied: "We'll see what happens." He said the United States would continue its "maximum pressure" campaign of sanctions to press North Korea to give up its nuclear weapons. Trump's move sent global share markets sharply lower before they regained some footing. Safe-haven buying of U.S. Treasury bonds pushed their yields lower, while the dollar weakened. The outlook for the meeting soured dramatically this month when North Korea angrily rejected the notion that it would agree to unilateral nuclear disarmament as Washington has demanded. Trump has said he detected a change in Kim's attitude after the second of two recent visits the North Korean made to China and that he was possibly being influenced by Beijing, with which the United States is embroiled in a major trade dispute. The cancellation came just hours after North Korea followed through on a pledge to blow up tunnels at its main nuclear test site, which Pyongyang said was proof of its commitment to end nuclear testing. The senior White House official said that among North Korea's broken promises was one to allow experts to witness the dismantlement of the site, which meant there was no one there to verify what actually occurred. Only a small group of international media handpicked by North Korea witnessed the demolition at the Punggye-ri site. 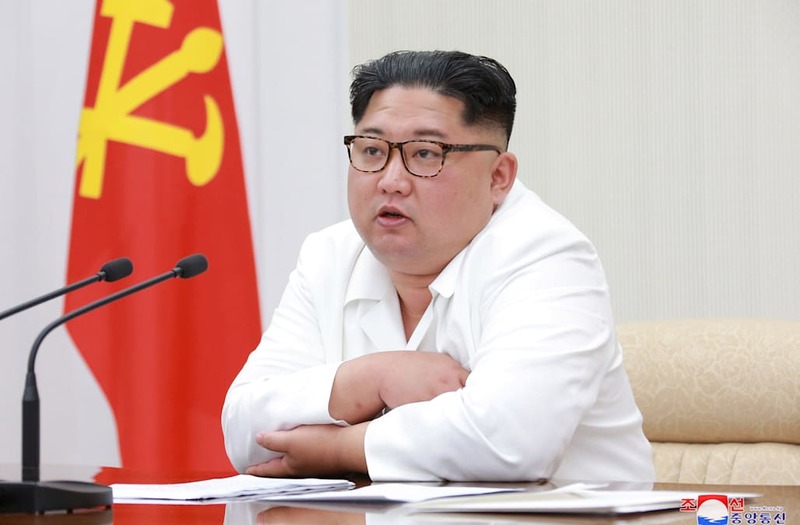 North Korea's announcement of its plan to destroy its only nuclear test site had been widely welcomed as a positive, if largely symbolic, step. Kim has declared his nuclear force complete, amid speculation the site was obsolete anyway. South Korean President Moon Jae-in, who worked hard to help set up the summit and urged Trump at a White House meeting on Tuesday not to let a rare opportunity slip away, said he was "perplexed" by the cancellation. He urged Trump and Kim to talk directly. The reference to Pence that offended the White House came in a statement released by North Korean media citing Vice Foreign Minister Choe Son Hui. She called Pence a "political dummy" for comparing North Korea - a "nuclear weapons state" - to Libya, where Muammar Gaddafi gave up his unfinished nuclear development program, only to be killed later by NATO-backed fighters. Trump had further raised expectations for a successful summit after North Koreareleased three Americans this month, which he called in his letter "a beautiful gesture" by Kim. While Trump left the door open for talks with Kim, chances for a quick rescheduling appear remote and the cancellation will renew fears of a return to conflict on the Korean peninsula. Trump's letter also referred to the possibility of war. "You talk about your nuclear capabilities, but ours are so massive and powerful that I pray to God that they will never have to be used," he said. North Korea's pursuit of nuclear weapons prompted fears of war last year after it said it tested an H-bomb and developed a missile capable of hitting the United States. Rhetoric reached new heights under Trump as he mocked Kim as "little rocket man" and threatened to "totally destroy" North Korea if necessary. Kim called Trump mentally deranged. The summit cancellation denies Trump of what supporters hoped could have been a major diplomatic achievement, worthy of a Nobel Peace Prize. It comes at a time when Trump’s withdrawal from the Iran nuclear deal has drawn criticism and his moving of the U.S. Embassy to Jerusalem has fueled violence. An investigation into alleged Russian meddling in the 2016 election hangs over his presidency. Robert Einhorn, a non-proliferation expert at the Brookings Institution, said it seemed Trump realized he would not get assurances from Kim of a willingness to give up its nuclear weapons. "He was, I think, reluctant to go to Singapore and come up short," he said. "This probably was the best choice he could make - much better than having a meeting that would deepen the divisions, lead to angry recriminations and set back any prospect for getting back on track."